When entering recovery from addiction, many people struggle with the seemingly normal life skills that others have acquired. Life skills can vary from goal setting and accountability, personal hygiene, healthy communication, budgeting, stress-management, and exercise. Most are these are life skills that everybody struggles with, but those in early recovery can view these as nearly impossible to learn or improve. Each of these life skills plays an important role in life from our childhood and on. These life skills will improve our life in early and long-term recovery from addiction. 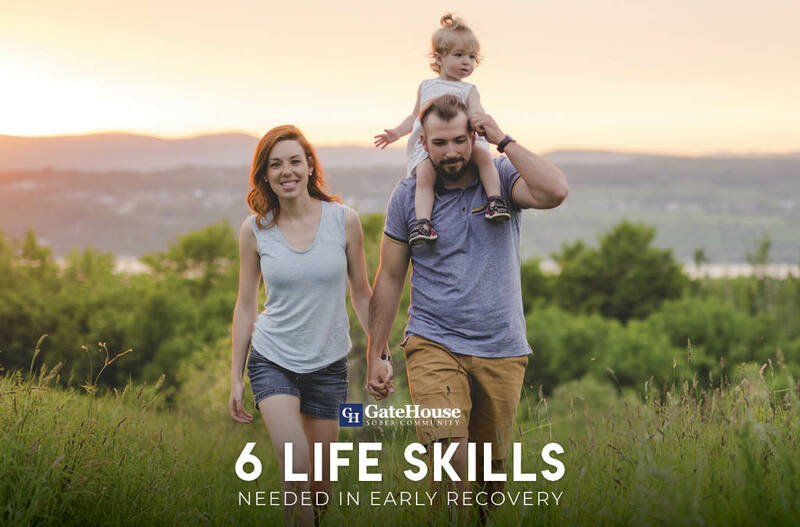 Learning to master or get a solid grasp on these life skills can help improve your life in recovery. These may seem rudimentary, but these life skills are still necessary for our lives as adults. Breaking them down to just seven can help it from being too overwhelming. We can’t learn life skills without having the foundation of healthy life skills. Perspective taking – empathy and understanding others. Communication – how to communicate and what you want to communicate, and how it will be interpreted by others. Making connections – from having information to knowing how to use the information. Critical thinking – Ongoing search for valid and useful knowledge to help guide decisions and thinking. Taking on challenges – Life is stressful. We have to learn how to handle that stress and not just avoid stress or cope poorly with it. Self-directed, engaged learning – We have to continue to learn and teach ourselves new things, it’s how we discover our talents and discover our potential. In active addiction, our only goal is to get more, and the only accountability we have is to show up to get more. If we could maintain employment, our accountability there was spotty. In addiction, we play the blame game and tend not to take responsibility for our actions and blame it on everything and everyone else. Accountability in recovery is something that we must learn. Goal setting is another life skill that can be difficult to master. Many in recovery struggle with perfectionism and feelings of inadequacy, (character defects). We have to learn not to overwhelm ourselves and set realistic goals. That’s why learning how to set appropriate goals is such an important life skill; it takes a lot of the pressure off of you especially setting time-based goals. There are stepping stone goals (set you up to accomplish another goal), short-term goals, long-term goals, and lifetime goals. Accountability and goal setting go together in life and recovery. When we set goals that are grandiose and impossible to reach in the time frame we have given ourselves, we feel like a failure. We throw our accountability out the window because we don’t want to hold ourselves responsible for setting unrealistic goals. We don’t want to take responsibility for not meeting our goal. This is where accountability life skills and goal setting life skills come together. We have to set realistic goals to keep ourselves accountable and be able to meet the goals we’ve set in place without beating ourselves up over it. Accountability also teaches us to take the steps necessary to complete these goals. A case manager in treatment or a life coach is a great person to turn to when it comes to learning life skills like goal setting and accountability. When we are drinking or using our hygiene can tend to fall to the wayside. Whether hygiene issues be from lack of resources (homelessness is a reality for many during their addiction), or it’s just not of importance when we’re too worried about drinking and using. Personal hygiene is something that we have to learn again. There are some good practices for personal hygiene. Your hygiene also ties in with your health! Especially mental health, depression can also be a cause of poor personal hygiene. Mental health diagnosis and substance use disorders are very common comorbidities. Learning good habits of personal hygiene may be an embarrassing life skill to tackle at first but it must be done. When we are coming into recovery, it is helpful to get into habits; this sets a schedule for us to follow and helps us get into a routine. Make yourself a checklist of personal hygiene. Ask yourself these questions every night and reflect on your day, this helps you to stay accountable to your schedule. Remember, don’t beat yourself up if you had a lazy day or have been sick and didn’t take a shower for one day. Did you brush your teeth at least once? Did I shower and wash my hair and body thoroughly? Did I put on deodorant? Did I wear clean clothes? Do I need to do laundry, so I have clean clothes for tomorrow? Do I need to trim my finger and toenails? Do I need to groom my facial hair? Did I wash my hands every time after leaving the restroom? After awhile of using a checklist, your hygiene will become part of your schedule, and you can add it to your life skills arsenal. While there are some people who weren’t taught about personal hygiene growing up, there is nothing to be embarrassed about. Talk to your case manager about life skills you need help with in early recovery or someone you’re close with, they will teach you. Communication is one of the earliest life skills we learn. We learn how to communicate when we’re hungry, what we need, when we’re hurt, or when we don’t understand something. Throughout life and especially addiction, we tend to communicate ineffectively. For us to incorporate the life skill of healthy communication into our tool belt of recovery, we have to understand what constitutes effective and ineffective communication. Trying to tackle grasping the life skill of healthy communication is probably one of the biggest learning curves we face. Learning how to effectively communicate with other people is hard, we’re not used to having to communicate or talk about our feelings, what’s bothering us, or anything that’s deeper than surface level. We must learn how to communicate with ourselves in a health manner first, then it will carry over into healthy communication with others. Healthy communication is a life skill that is useful in all aspects of your life from employment to romantic relationships. Money is one of the biggest struggles that everyone faces. Whether there isn’t enough, you spend too much, spend too little, make poor investments, or gamble it all away, money management is a life skill that everyone needs. Especially in early recovery, a case manager can help you with making a financial plan and teach you how to stick to your plan. Working with someone else when it comes to our budgeting it can show us how to be more responsible with our income, how to pay bills and manage our expenses. A case manager can also help us figure out payment plans to make financial amends. There are some general tips for budgeting and money management to help you get a grasp on what goes into money management. Over time you develop budgeting and money management life skills after working with someone who has a better understanding of money management. If you are making large purchases like a car and need a loan, it’s still best to talk to a financial advisor about the options for you that are within your budget. Stress is a normal part of life, in early recovery we’re just learning how to cope with stress without the use of drugs and alcohol. It can be a trying time, and many menial everyday life tasks stress us out. Stress is an inevitable part of life, we just have to learn how to handle it. Stress is inescapable, learning how to manage the way we react to stress is one of the best life skills we will learn. We tend to have poor coping skills when we’re in early recovery and even people who don’t struggle with substance use disorders can too. Working through therapy and a 12-step program can help you with stress management techniques because we gain more awareness to the cause of stress, there are also general tips for stress management that can help you in your everyday life. Try relaxation techniques – mindful meditation is extremely helpful with stress. Talk to someone – you should be able to talk to your sponsor or other sober supports about stressful things in your life. Take control – sometimes we are stressed out by things that we can’t change. If we accept them for what they are or learn that we cannot fix them, it can alleviate some of our stress. Or find a solution if it is still stressing us out. Manage your time – you’ll feel less stressed if you’re not rushing or overloading yourself with commitments and tasks. Learn how to say no – no is a complete sentence. It takes a while to learn that life skill, but it can greatly reduce our stress or at least help us manage it. Rest if you don’t feel well. Running yourself down makes you more susceptible to stress and will keep you ill for longer. Stress management is one of the best life skills that we can learn, we just have to remember to use our skills when we are stressed. The correlation between healthy eating habits and mental health is staggering. You don’t think that there is much of a benefit with what you eat and the effect it has on your brain. What you put in is what you get out, besides from uncomfortable physical symptoms like bloating and an upset stomach what you eat can affect your mind and some foods help it perform better. You also need to have healthy eating habits to keep yourself going. The old acronym HALT is especially true in early recovery. Exercise is equally as important as healthy eating habits regarding physical health and mental health. Exercise does wonders to improve mood, release stress and is a healthy coping skill. Exercise doesn’t always have to be a 3-hour session in the gym, as addicts and alcoholics we tend to operate in extremes. Everything is good in moderation, even exercise! When learning how to have healthy eating and exercise regimens, it gives us another life skill that can carry over into other areas of our lives. Self-control, goal setting, and accountability come into play with exercise and healthy eating. There are bountiful mental health benefits of exercise, some that you wouldn’t even realize are a benefit from exercise. Improve your self confidence – boosting your self-esteem is usually something we need when we’re in early recovery. Learning self-love is another life skill that exercise can help. Enjoy the outdoors! Exercising outdoors has more benefits than you would think, including getting vitamin D.
Helps with addiction recovery – the brain releases dopamine when you exercise, the feel good chemical that most illegal drugs and alcohol affect. The term life skills may seem overused at some points; it’s easy to overlook what life skills are. Their name says it all, but we tend to forget that these apply to so many other areas of our lives besides addiction recovery. When we begin working the 12 steps we have a sponsor take us through the steps because we don’t know how to go through them. We have to do the same when it comes to life skills that we don’t know how to do; we have to have someone who has learned that life skill to teach us. Remember, there is no shame in not knowing how to do something.